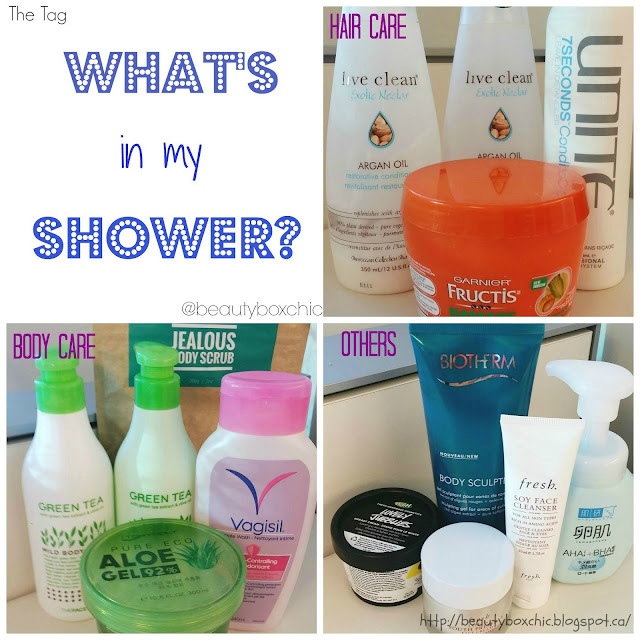 Today, I am very excited to share with you "What's in my Shower?" tag. 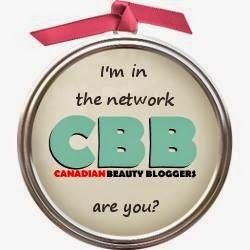 I recently discovered this tag from Angela's blog over at Raincouver Beauty, after reading her blog post, I become intrigued!!!! With that said, let me share with you all the products I am currently using in the shower. Let me get started as there are quite a few products to talk about! 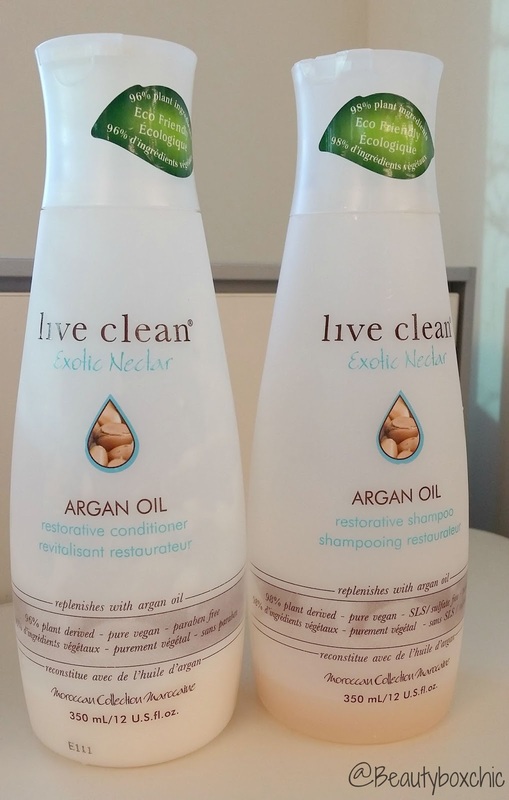 Live Clean Exotic Nectar Argan Oil Restorative Shampoo & Conditioner is made with 100% Argan oil, organic grape seeds and olive oil to "condition, shine and UV protect" our hair - Live Clean The Shampoo gently cleanses my hair. My hair feel nourish after used. However, the conditioner does not long time condition my hair. This conditioner does not work well for me. Yet, prices for Live Clean products are very reasonable! 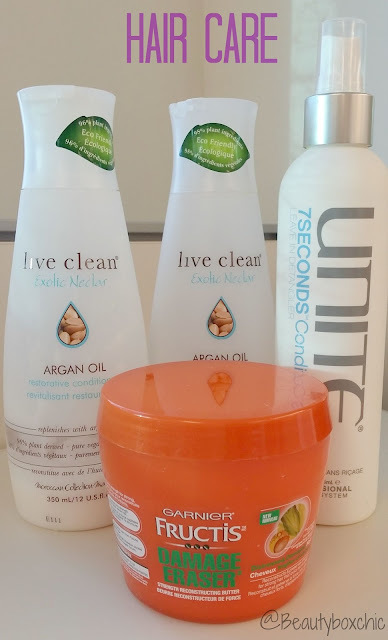 They offer numerous haircare products for their beauty consumers, If you are looking for a new shampoo/conditioner line to try out, you must check out their products! 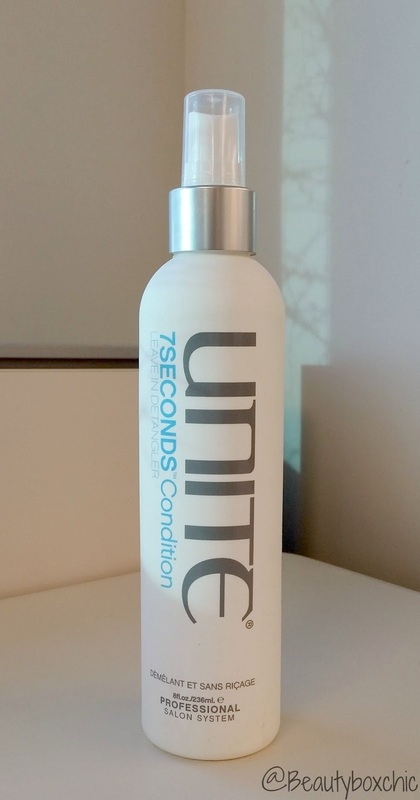 Unite 7SECONDS™ Condition Leave in Dantangler instantly detangles , UV/thermal protects and "repair,strengthen and nourish hair" - Unite 7SECONDS™ Condition I love this product, not only does it smell wonderful after applying on my hair, it also works well for me, making my hair not only feel moisturized but very nourished too!!! 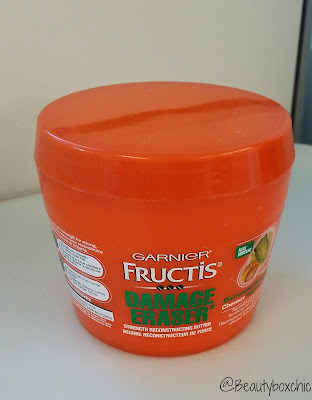 Garnier Frutis Damage Eraser Strength Reconstructing Butter , I received this product from Influenster, it is a great hair mask that I use in a rotational basis. 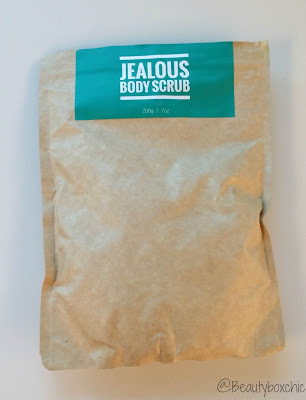 Jealous Body Scrub Coconut + Coffee made with 100% ingredients like "premium Robusta Coffee/ Coffee Grounds, organic cold pressed coconut oil, brown sugar & sea salt and vitamin E and minerals" - Jealous Body Scrub I received this from Jealous Body Scrub for review, it work well for my prone sensitive skin and protect/repair and exfoliate my skin. 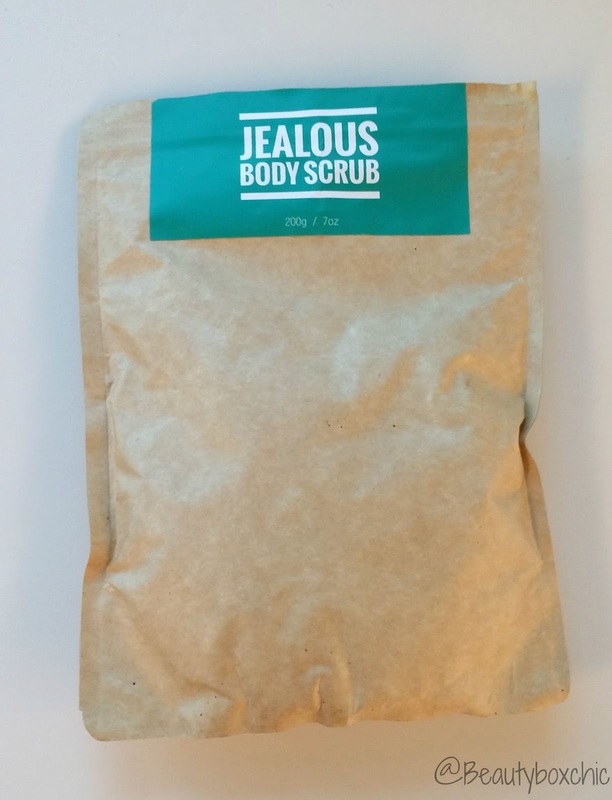 Not only this, I love smell of this body scrub. Check out my full review here. 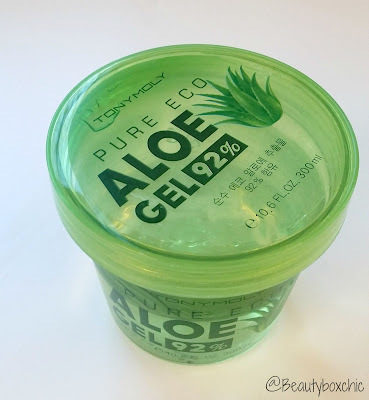 Tony Moly Pure Eco Aloe Gel is great for daily use after the shower, it is so gentle to the skin and made with 92% aloe extract!!! It works well on my prone sensitive skin. I received this as a gift from my aunties back in April this year from my Hong Kong visit. Check out my full review here. TheFaceShop Green Tea Mild Body Wash and Body Lotion is made with green tea extract and olive oil!!! 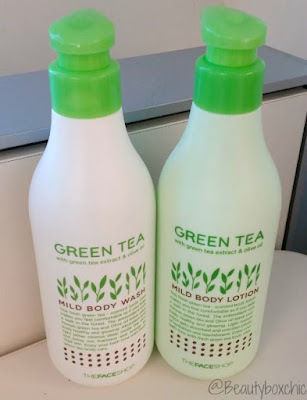 The scent is amazing, it remind me of one my favorite scrub Elizabeth Arden Green Tea Revitzlize, you can check out my previous review here. Vagisil Feminine Wash is gentle formula, great to be use in everyday shower, not only it is clinically & gynecologist tested, the scent is super mild and great odour protection for feminine area. 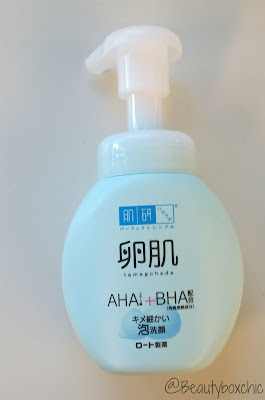 Hada Labo Tamagohada Daily Foaming Face Wash is a gentle foaming cleansing face wash, work well for my prone sensitive skin, no irritation after used!!! My sister purchased this from her Hong Kong Trip and we have been using this the past month now, it work great for me and I am starting to really like this product too!!! 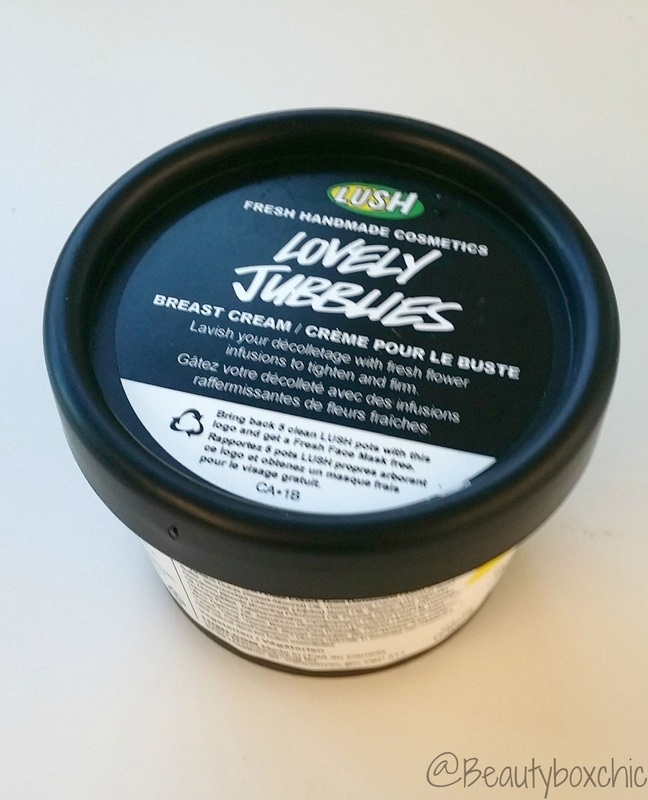 Lush Lovely Jubblies I found this hidden gem from one of my favorite store, Lush. This product not only made with "organic almond/avocado oil, orange blossom honey, organic coco butter and cold pressed organic Jojoba/primrose oil" - Lush I love the smell of this cream (the jasmine scent is so lovely), it works well for me, I also use this cream daily on my neck area too!!! 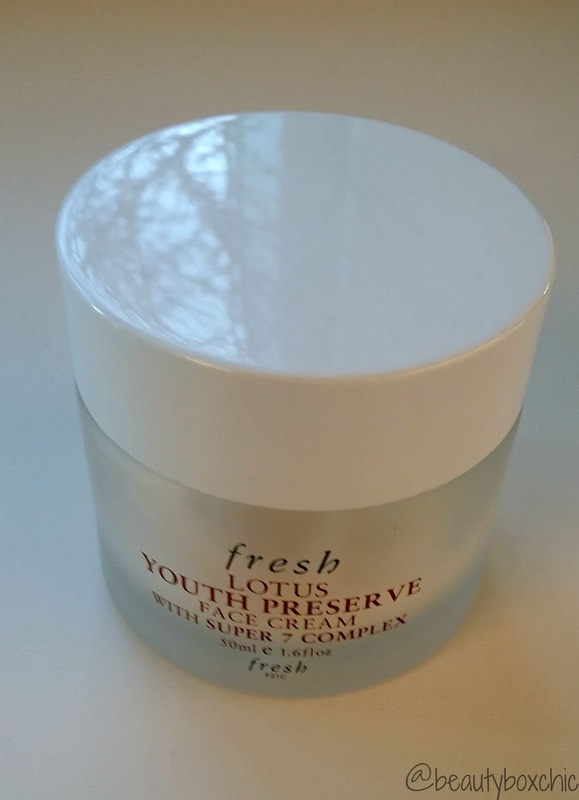 Fresh Lotus Youth Preserve Face Cream is by one of my favorite line from Fresh, I love the lotus scent, it so refreshing and lovely. If you haven't check out my first giveaway on Fresh Lotus skincare set which include this lovely face cream, you must click here for contest details. Fresh Soy Face Cleanser I have been using this for a two weeks now, just like the Fresh Lotus face cream, I am loving this Soy Face Cleanser just as much!!! 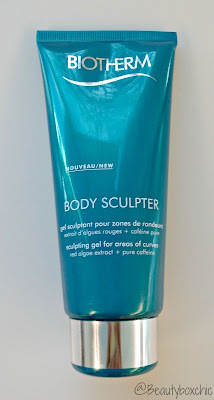 In the future I will do a full review on this lovely product!!! 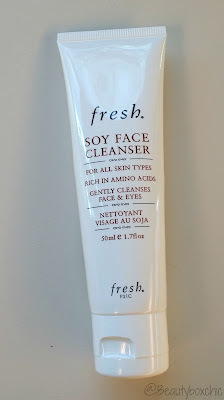 If you haven't check out my first giveaway on Fresh Lotus skincare set which also include this lovely face wash, click here for full giveaway details. 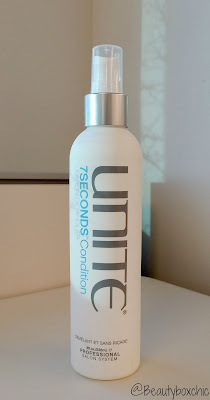 If I have to pick one out of the products that I am currently using (which was extremely difficult for me to pick...),it is the Unite 7 Seconds Condition Leave in Dantangler, which I absolutely love and use daily; I wouldn't feel complete if I do not comb my hair with this after my shower. What is your favorite Shower go-to products? Is there a product you cannot live out? Comments below, I love to hear from you. I love Live Clean products! They're great quality with an affordable price tag. Perfect for people on a budget! I also have some Vagisil in my shower too, and actually made a hair care/shower routine post and was deciding whether or not to put it in my post but ended up doing it anyway! I'm glad someone else put it up too hehe. Glad you did the post too!! 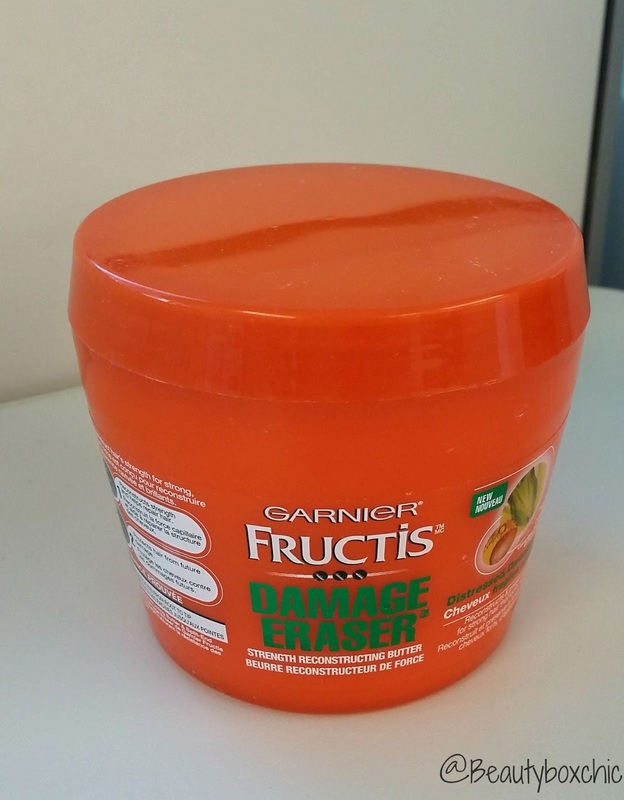 The 7 seconds detangler sounds great! Reminds me of when I was little and used the l'oreal spray detangler haha. I will need to keep my eyes out for it. I also can't wait to get more LUSH products. I've seen the Live Clean brand before but never tried it. I think I want to look for the argan line to try out! love this post janet :) a lil diff from your usual post, more of this pliz! lovely jubblies works for me too haha, i also used it on my undereye area. 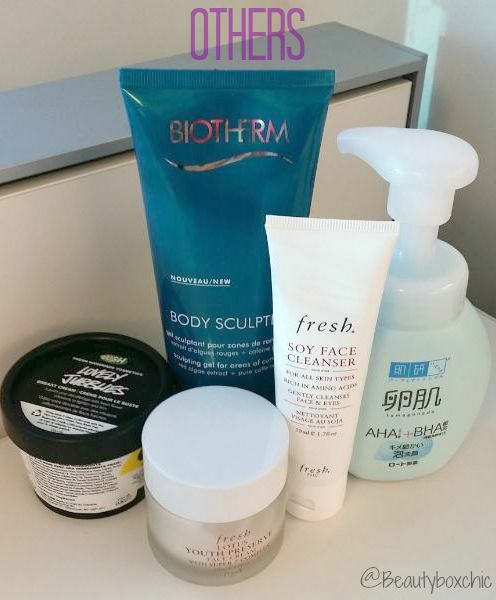 aaandd youre the 2nd blogger who raved about the fresh soy cleanser. im getting really intrigued! Happy 1 Year + First Giveaway!!! !